In the summer, I get the hankering to pretend its cold outside. I lock myself in the house, crank the air conditioning and eat fall comfort foods. Pre head the oven to 350 degrees. Wash the chicken and pat dry with a paper towel. Place the chicken on a rack inside a roasting pan. 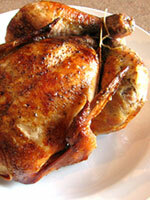 Drizzle the chicken, in and out, with olive oil. Rub the oil in. Cut the lemon in half and squeeze the juice over the outside of the chicken. Sprinkle the skin and cavity with the salt, pepper, garlic powder, seasoning and parsley. Stuff the cavity with the lemon. Place a thermometer in the chicken, set the temperate and cook until done. While the chicken is cooking prepare the broccoli. Heat a large pot of salted water. Melt the butter in a frying pan on medium head. Add the onion and garlic and sauté the vegetables until the onions caramelize and turn brown. Turn off the heat and add in the crumbs, cheese, dried mustard, Dijon mustard and season with salt and pepper. Stir to combine and set aside. Once the water is boiling, add in the broccoli. Blanch the broccoli for about 5 minutes then drain. 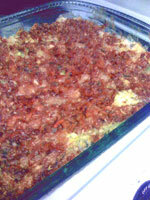 In a large casserole dish, mix the cream, cheese, mustard and salt and pepper. Add in the broccoli and toss to coat. 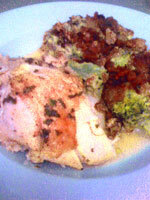 Cover the broccoli with the breadcrumb mixture. Set aside until the chicken is finished cooking. Remove the chicken from the oven and let it rest on the counter. Put the broccoli in the oven and cook for 20 minutes. The broccoli will be heated through and the topping will brown. Bacon, Eggs and Cheese for Dinner?